Dino Zoff (Italian pronunciation: [ˈdiːno dˈdzɔf]; born 28 February 1942) is a former Italian professional football goalkeeper and is the oldest winner ever of the World Cup, which he earned as captain of the Italian national team in the 1982 tournament in Spain, at the age of 40 years, 4 months and 13 days, also winning the award for best goalkeeper of the tournament, and being elected to the team of the tournament, for his performances, keeping two clean-sheets, an honour he also received after winning the 1968 European Championship on home soil; he is the only Italian player to have won both the World Cup and the European Championship. Zoff also achieved great club success with Juventus, winning 6 Serie A titles, 2 Coppa Italia titles, and an UEFA Cup, also reaching two European Champions' Cup finals in the 1972–73 and 1982–83 seasons, as well as finishing second in the 1973 Intercontinental Cup final. Zoff was a goalkeeper of outstanding ability, and he has a place in the history of the sport among the very best in this role, being named the 3rd greatest goalkeeper of the 20th century by the IFFHS behind Lev Yashin and Gordon Banks. He holds the record for the longest playing time without allowing goals in international tournaments (1142 minutes) set between 1972 and 1974. With 112 caps, he is the fifth most capped player for the Azzurri. In 2004 Pelé named him as one of the 125 greatest living footballers. In the same year, Zoff placed fifth in the UEFA Golden Jubilee Poll, and was elected as Italy's golden player of the past 50 years. He also placed second in the 1973 Ballon d'or, as he narrowly missed out on a treble with Juventus. In 1999, Zoff placed 47th in World Soccer Magazine's 100 Greatest Players of the Twentieth Century. After retiring as a footballer, Zoff went on pursue a managerial career, coaching the Italian national team, with which he reached the Euro 2000 Final, and several other Italian clubs, including his former club Juventus, with which he won an UEFA Cup and a Coppa Italia double during the 1989–90 season, trophies he had also won as a player. In September 2014, Zoff published his Italian autobiography Dura Solo un Attimo la Gloria ("Glory only Lasts a Moment"). Dino Zoff was born in Mariano del Friuli, Friuli-Venezia Giulia, Italy into a farming family. Upon his father's suggestion, Zoff initially also pursued studies to be a mechanic in case his football career proved to be unsuccesful. As a young aspiring footballer, Zoff was also interested in other sports, and his two main role models were the cyclist Fausto Coppi, and the race walker Abdon Pamich. 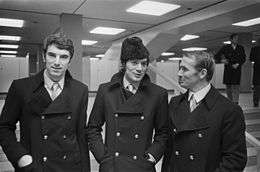 Zoff (left) at Napoli in 1970 with Antonio Juliano and Kurt Hamrin, at Schiphol for the match of Inter-Cities Fairs Cup against Ajax Amsterdam. Zoff's career got off to an inauspicious start, when at the age of fourteen he had trials with Inter Milan and Juventus, but was rejected due to a lack of height. Five years later, having grown by 33 centimetres (supposedly due to his grandmother Adelaide's recommended increased daily intake of eight eggs), he made his Serie A debut with Udinese on 24 September 1961, in a 5–2 defeat to Fiorentina, although Zoff was not criticised for any of the goals he conceded. Zoff made only four appearances in his first season for Udinese, as they were relegated to Serie B. He played the next season as the club's starting goalkeeper, helping the club to Serie A promotion, before moving to Mantova in 1963, where he spent four seasons, making 131 appearances. His performances for Mantova in the top flight caught the attention of larger clubs, while Italy's national coach at the time, Edmondo Fabbri, even considered bringing him as a back-up for the 1966 FIFA World Cup, although he ultimately chose to bring Enrico Albertosi, Roberto Anzolin, and Pierluigi Pizzaballa instead. In 1967, Zoff was transferred to Napoli, in exchange for fellow goalkeeper Claudio Bandoni, and a transfer fee of 130 million Lire; he spent five seasons in Naples, making 143 Serie A appearances with the club. During this time, he began to achieve increasing recognition in Italy, also making his International debut with the Italian national side in 1968, and earning a place in Italy's squads at Euro 68 and the 1970 World Cup. Following his achievements with the national side, and due to his performances during his time with Napoli, Zoff signed for Juventus in 1972, at the age of 30, where he resumed his success. In eleven years with Juventus, Zoff won the Serie A championship six times, the Coppa Italia twice and the UEFA Cup once, also reaching two European Cup finals, and the semi-finals of the European Cup Winners' Cup during the 1979–80 season. In 1973, he placed second in the Ballon d'Or, following his Serie A title victory, also narrowly missing out on an historical treble with Juventus, after reaching both the European Cup and the Coppa Italia finals that season, in which his club were defeated, however; Juventus also finished as runners-up in the 1973 Intercontinental Cup that year. Overall, Zoff made 479 appearances for Juventus in all competitions, making 330 Serie A appearances with the club (all of which came consecutively, a club record), 74 in the Coppa Italia, 71 in European Competitions, and 4 in other Club Competitions. He is currently Juventus's 6th record appearance holder in all competitions their 7th all-time appearance holder in Serie A, their 3rd all-time appearance holder in the Coppa Italia, their 7th all-time appearance holder in UEFA Club competitions, and their 9th all-time appearance holder in international club competitions. 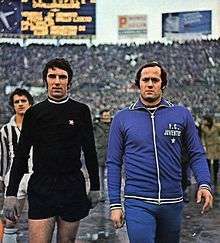 Zoff (left) at Juventus in 1975 near his substitute Massimo Piloni. Zoff won his final Serie A championship with Juventus during the 1981–82 Serie A season, also winning the 1982 FIFA World Cup with Italy that year, as his team's captain. During the following 1982–83 season, the final season of his career, Dino Zoff won the Coppa Italia with defending Serie A champions Juventus, and he reached his second European Cup final with the club in 1983. Juventus were defeated 1–0 by Hamburg in Athens on 25 May, after Zoff was beaten by Felix Magath's long-distance strike; this was the final match of his career. His final league appearance came in a 4–2 home win over Genoa on 15 May 1983. Upon retirement, Zoff held the records for the oldest Serie A player, at the age of 41, and the most Serie A appearances (570 matches) for more than 20 years, until the 2005–06 season, when the records were broken by S.S. Lazio goalkeeper Marco Ballotta, and A.C. Milan defender Paolo Maldini respectively. Behind only former A.C. Milan goalkeeper Sebastiano Rossi, who overtook him during the 1993–94 season, Zoff has conceded the fewest goals in a single Serie A season; behind only Gianluigi Buffon and Sebastiano Rossi, he has also gone the most time unbeaten in Serie A without conceding a goal, producing a 903-minute unbeaten streak during the 1972–73 season, a record that stood until Rossi overtook him in the 1993–94 season; Buffon broke the record during the 2015–16 season. He also held the Serie A record for most consecutive clean sheets alongside Rossi (9), until Gianluigi Buffon overtook them both with his 10th consecutive clean sheet in 2016. With 570 Serie A appearances, Zoff is also the sixth highest appearance holder in Serie A of all time, and he is the fourth oldest player in Serie A to have ever played a match. He holds the record for most consecutive matches played in Serie A (332), a streak which went unbroken from 21 May 1972 (in a 0–0 home draw with Napoli against Bologna), until his final league appearance with Juventus in 1983. At 41 years and 86 days, Zoff is also the oldest player to have appeared in a European Cup or UEFA Champions League Final. Prior to representing the senior Italian side, Zoff had won a gold medal with the Italy under-23 side at the 1963 Mediterranean Games. On 20 April 1968, Zoff made his senior debut for Italy, playing in a 2–0 win against Bulgaria in the quarter finals of the 1968 European Championships, in Naples. Zoff ended up being promoted to starting goalkeeper over Enrico Albertosi during the tournament, and Italy proceeded to win the European Championship on home soil, with Zoff taking home a winners' medal after only his fourth international appearance, keeping two clean sheets, and winning the award for the best goalkeeper of the tournament. Zoff was left out of the Italian starting eleven in the 1970 World Cup, however, and was Albertosi's deputy throughout the tournament, as Italy went on to reach the final of the World Cup, and was defeated 4–1 by Brazil. He returned to the starting line-up, however, ahead of Albertosi, in Italy's disappointing 1974 World Cup campaign, during which they would be eliminated in the first round. Franco Causio, the Italian president Sandro Pertini, Zoff (lower left) and the coach Enzo Bearzot on their return from Spain with the 1982 World Cup barely won. 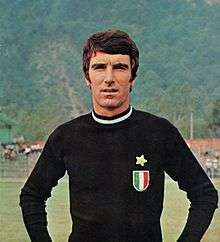 From 1972 onwards, Zoff became Italy's undisputed number 1, and he participated in the 1978 World Cup with Italy, during which he managed a fourth-place finish, keeping 3 clean-sheets. Italy were eliminated in the semi-final, in a 2–1 loss to the Netherlands. After the match, Zoff was criticised for making a fairly uncommon error, as he was beaten by a strike from distance by Arie Haan. Zoff was also Italy's starting goalkeeper once again at the 1980 European Championships on home soil, however, helping his side to reach the semi-finals, finishing the tournament in fourth place once again. During the 1980 European Championship, Zoff kept three clean sheets, only conceding one goal in the bronze medal match, which Italy would lose on penalties; Zoff was elected as the goalkeeper of the tournament once again, an honour he had previously managed after winning the tournament in 1968. Throughout these two tournaments, Zoff established a record for most consecutive minutes unbeaten in a European Championship, which was later beaten by Iker Casillas in 2012. Zoff had also established the record for most minutes unbeaten European Championship qualifying, which was also beaten, by compatriot Buffon in 2011. He still holds the record, however, for most consecutive minutes without conceding a goal at the European Championships including qualifying, having kept eight consecutive cleans heets between 1975 and 1980, while going unbeaten for 784 minutes. Alongside Casillas, Buffon, and Thomas Myhre, he is the goalkeeper with the fewest goals conceded in a single edition of the European Championships, having conceded only one goal in the 1968 European Championships; of these players, only Zoff and Casillas won the title while achieving this feat. "He was a level-headed goalkeeper, capable of staying calm during the toughest and the most exhilarating moments. He always held back both out of modesty and respect for his opponents. At the end of the Brazil match, he came over to give me a kiss on the cheek, without saying a single word. For me, that fleeting moment was the most intense of the entire World Cup." Zoff also holds the record for the longest stretch (1142 minutes) without allowing any goals in international football, set between 1972 and 1974. That clean sheet stretch was ended by Haitian player Manno Sanon's beautiful goal during the 1974 World Cup. Zoff made his final appearance for Italy on 29 May 1983, in a 2–0 away loss to Sweden, in an Euro 1984 qualifying match. At the time of his retirement, Zoff's 112 caps were the most ever by a member of the Italian national team. He currently sits in fifth place in this category, as well as second among goalkeepers, Gianluigi Buffon having surpassed the latter record. Zoff was a traditional, effective, and experienced goalkeeper, who usually favoured efficiency and caution over flamboyance when making saves, although he was also capable of producing spectacular and decisive saves when necessary. He was particularly regarded for his outstanding positioning and handling of the ball, as well as his concentration, consistency, calm mindset, and composure under pressure; he also possessed good reactions and shot-stopping abilities, and was known for his attention to detail, and his ability to read the game, anticipate his opponents, and communicate with and organise his defence. Despite his reserved character, Zoff also drew praise for his leadership skills, correct behaviour, and competitive spirit, which led him to serve as captain of his national side. Known for his work-rate, dedication, and discipline as a footballer, Zoff also stood out for his stamina, longevity, and determination, which enabled him to have an extensive and highly successful career, due to his constant desire to improve himself. Regarded as one of the greatest goalkeepers of all time, he was elected in a poll by the IFFHS as the third best goalkeeper of the 20th Century – after Lev Yashin (1st) and Gordon Banks (2nd). During the 1989–90 season, Juventus won both the UEFA Cup and the Coppa Italia under their coach Dino Zoff. After his retirement as a player, Zoff went into coaching, joining the technical staff at Juventus, initially as a goalkeeping coach, although this experienced proved to be unsatisfactory for him. He subsequently coached the Italian Olympic side, his first experience as a coach, helping the team to qualify for the 1988 Summer Olympic Games in Seoul, before returning to Juventus in a coaching role; the Italian Olympic side eventually managed a fourth-place finish in the final tournament. Zoff served as Juventus's head coach from 1988 to 1990. In 1990 he was sacked, however, despite winning the UEFA Cup and the Coppa Italia during the 1989–90 season, while also helping the club to a third-place finish in the league. He then joined Lazio, where he became the coach in 1994, and later the club's sporting director, winning the Coppa Italia in 1998, and helping the club to an UEFA Cup final the same season, and was defeated by compatriots Inter. In 1998, Zoff was appointed as the head coach of the Italian national team. Although Italy were still cautious and organised defensively, Zoff used a more open, fluid, and attacking style of play than that used by his more defensive Italian coaching predecessors Cesare Maldini and Arrigo Sacchi. Zoff helped the team to qualify for Euro 2000, and he introduced several younger players to the team, such as Francesco Totti, Gianluca Zambrotta, Stefano Fiore, Massimo Ambrosini, Christian Abbiati, Marco Delvecchio, and Vincenzo Montella. Although Italy were not favourites, he coached a young Italy squad to a second-place finish in Euro 2000, suffering a 2–1 extra-time defeat at the hands of reigning World Cup Champions France in the final, due to a golden goal by David Trezeguet. En route to the final, a ten-man Italy had eliminated co-hosts the Netherlands in the semi-finals in a penalty shoot-out, after a 0–0 draw, following extra-time. In the final of the tournament, Italy had been 1–0 up for most of the second half, and were less than sixty seconds away from winning the tournament, before France forward Sylvain Wiltord scored in the fourth and final minute of stoppage time to equalise, and send the match into extra time. Despite reaching the final, Zoff resigned a few days later, following strong criticism from A.C. Milan president and politician Silvio Berlusconi. Zoff was voted the World Soccer Manager of the Year in 2000. Zoff returned to defending Serie A, Coppa Italia, and Supercoppa Italiana champions Lazio as a manager for the next season, replacing Sven-Göran Eriksson in 2001, and finishing third in Serie A. The following season, he resigned on 20 September, after only the third match, due to a poor start to the 2001–02 season. In 2005, he was named the coach of Fiorentina as a replacement for Sergio Buso. Despite saving the team from relegation on the last day of the season, Zoff was let go. Zoff is married to Annamaria Passereini; they have a son, Marco, born in 1967. On 28 November 2015, it was reported Zoff was hospitalized for three weeks with a viral neurological infection, which made it difficult for him to walk. On 23 December 2015, it was reported Zoff had been recovering well, however stating, "For the first time in my life, I was actually afraid... When I say scared, I wasn't afraid for myself, but for those around me. My wife, my son, my grandchildren. My tribe, basically. I would've really hurt them by leaving." He also revealed, "One night I saw two figures at the end of my bed. They had the faces of Gaetano Scirea [one of his deceased teammates] and Enzo Bearzot [one of his deceased coaches]. They were both smiling. I wasn't asleep, it wasn't a dream. I told them: 'Not yet, not now.' And I am still here." November 2003: Italy's Golden Player – the best Italian player of the last 50 years, selected by the Italian Football Federation. ↑ "I 70 anni di Dino Zoff" (in Italian). RAI. Retrieved 15 July 2016. 1 2 "Il mito compie 70 anni: auguri Dino Zoff, campione di sport e di vita" (in Italian). Italian Football Federation. Retrieved 9 June 2016. 1 2 Luigi Garlando (8 September 2008). "E se Buffon fosse più bravo di Zoff?" (in Italian). La Gazzetta dello Sport. Retrieved 9 June 2016. 1 2 3 4 5 6 Michael Cox. "Dino Zoff: The quiet genius". ESPN. Retrieved 9 June 2016. 1 2 IFFHS' Century Elections – rsssf.com – by Karel Stokkermans, RSSSF. ↑ Neale Graham (9 February 2009). "The best goalkeepers of all time". CNN. Retrieved 3 May 2016. 1 2 "World Soccer Players of the Century". World Soccer. Retrieved 5 January 2015. ↑ "Calcio, Zoff si inventa scrittore: "Dura solo un attimo la gloria"" (in Italian). La Gazzetta dello Sport. 22 September 2014. Retrieved 5 January 2015. 1 2 3 4 5 6 7 8 9 10 11 "Italy's towering guardian". FIFA.com. Retrieved 26 November 2016. 1 2 "I 'vecchietti' del Campionato Europeo UEFA" (in Italian). UEFA.com. 7 February 2014. Retrieved 25 November 2016. 1 2 3 4 5 6 7 8 9 Fabrizio Maffei. "Zoff, Dino". Treccani: Enciclopedia dello Sport. Retrieved 26 November 2016. ↑ "Dino Zoff" (PDF). Retrieved 5 January 2015. 1 2 3 Giorgio Dell’Arti; Massimo Parrini (5 October 2008). "Dino Zoff - biografia" (in Italian). Il Corriere della Sera. Retrieved 26 November 2016. ↑ "Zoff shares Buffon record". Football Italia. 13 November 2011. Retrieved 13 March 2016. 1 2 3 4 5 6 "Classic Football: Dino Zoff – I was there". FIFA Official Site. ↑ "Zoff: 'Buffon is the best'". Football Italia. 12 March 2016. Retrieved 12 March 2016. ↑ "Buffon sets new Serie A record". Football Italia. 20 March 2016. Retrieved 20 March 2016. 1 2 3 "Juventus rallies around stricken legend Dino Zoff". The Score. 28 November 2015. Retrieved 26 November 2016. ↑ "Nazionale in cifre: Zoff, Dino". figc.it (in Italian). FIGC. Retrieved 27 April 2015. ↑ "World Cup Hall of Fame: Dino Zoff". Sports Illustrated. Archived from the original on 12 September 2005. 1 2 "Record e Curiosità" [Records and Trivia] (in Italian). La Repubblica. Retrieved 6 May 2016. ↑ "Zoff, 70 years of quiet success". FIFA.com. 27 February 2012. Retrieved 26 November 2016. ↑ Ivan Speck (4 July 2000). "Zoff resigned after attack from Berlusconi". espnfc.com. Retrieved 28 April 2016. 1 2 Jamie Rainbow (14 December 2012). "World Soccer Awards – previous winners". World Soccer.com. Retrieved 21 December 2015. ↑ "Zoff reportedly in hospital". Football Italia. 28 November 2015. Retrieved 23 December 2015. ↑ "Dino Zoff hospitalized with viral infection". Sports Net. 28 November 2015. Retrieved 23 December 2015. ↑ "Zoff: 'I saw Bearzot'". Football Italia. 23 December 2015. Retrieved 23 December 2015. ↑ "Dino Zoff" (in French). L'Èquipe. Retrieved 10 December 2015. 1 2 Stefano Bedeschi (28 February 2014). "Gli eroi in bianconcero: Dino Zoff" (in Italian). Tutto Juve. Retrieved 10 December 2015. ↑ "Dino Zoff". Eurosport. Retrieved 10 December 2015. ↑ "D. Zoff". Soccerway. Retrieved 10 December 2015. ↑ "Dino Zoff". UEFA.com. Retrieved 10 December 2015. ↑ "UEFA Golden Player: Dino Zoff". www.uefa.com. 9 November 2013. Retrieved 23 November 2015. ↑ "Zinedine Zidane voted top player by fans" (PDF). uefa.com. UEFA. Retrieved 24 July 2014. ↑ Rob Moore; Karel Stokkermans (21 January 2011). "European Footballer of the Year ("Ballon d'Or")". RSSSF. Retrieved 23 November 2015. ↑ "FIFA Order of Merit Holders" (PDF). FIFA.com. Retrieved 20 January 2015. ↑ "Pele's list of the greatest". BBC Sport. 4 March 2004. Retrieved 15 June 2013. ↑ "1968 team of the tournament". UEFA. 1 April 2011. Retrieved 29 April 2015. ↑ "UEFA Euro 1980 team of the tournament". UEFA. 1 July 2011. Retrieved 27 March 2015. 1 2 "FIFA World Cup Awards: All-Star Team". Retrieved 22 March 2015. ↑ "Golden Foot Legends". goldenfoot.com. Golden Foot. Retrieved 27 March 2015. ↑ "Hall of fame, 10 new entry: con Vialli e Mancini anche Facchetti e Ronaldo" [Hall of fame, 10 new entries: with Vialli and Mancini also Facchetti and Ronaldo] (in Italian). La Gazzetta dello Sport. 27 October 2015. Retrieved 27 October 2015. ↑ "Inaugurata la Walk of Fame: 100 targhe per celebrare le leggende dello sport italiano" (in Italian). Coni. 7 May 2015. Retrieved 26 August 2015. ↑ "CNA 100 Leggende CONI per data di nascita" (PDF) (in Italian). Coni. Retrieved 23 September 2015. ↑ "IFFHS Legends". IFFHS. Retrieved 14 September 2016. ↑ "Dino Zoff". Retrieved 20 January 2015. ↑ "Zoff Sig. Dino – Commendatore Ordine al Merito della Repubblica Italiana". quirinale.it (in Italian). 25 October 1982. Retrieved 19 March 2015. ↑ "Zoff Sig. Dino – Grande Ufficiale Ordine al Merito della Repubblica Italiana". quirinale.it (in Italian). 12 July 2000. Retrieved 19 March 2015. Wikimedia Commons has media related to Dino Zoff. Golden Glove was first awarded in 1994.